CHICAGO--(BUSINESS WIRE)-- Hyatt Hotels Corporation (NYSE:H) and Chesapeake Lodging Trust (NYSE:CHSP) (the “Trust”) today announced the opening of Hyatt Herald Square New York. Ideally located in Midtown Manhattan’s lively Herald Square neighborhood, the 122-room hotel draws on inspiration from the area’s rich publishing history and neighboring Fashion District – both of which serve as inspiration for the hotel’s design, dining, services and amenities. Located on West 31st Street between 5th Avenue and Broadway, the building housing Hyatt Herald Square New York has been designed by famed interior designers Paul Vega and Vennie Lau of VLDG Inc., who studied the history of Herald Square to procure the design elements and palettes for the hotel’s lobby, hallways, guestrooms, and rooftop. Every aspect of the hotel’s design exudes a mixture of fashion and industrial newspaper printing elements, composed of bright pops of colors, glass, custom fabrics and millwork, reclaimed wood, letterpress blocks, pounded metal and other nuanced details. The lobby, adorned with the artwork of nine local artists, serves as its own destination. The inviting lobby features several themed communal areas including an espresso bar with café counter, an on-site market for on-the-go snacks and a library-themed lounge, bar and private dining space with comfortable seating and a bookshelf. Upon arrival, hotel ambassadors will personally greet each guest and invite them to experience the lobby or head to their guestroom. To create a seamless experience between check-in and settling in, the traditional check-in desk experience has been abandoned for a smooth, bowl-shaped desk toward the back of the lobby sitting in front of a curved metal door with embossed lettering. This is located steps away from the hotel’s comfortable bar and lounge. Adjacent to the check-in area, a small concierge desk made from decorative newspaper stacks of different colors and textures fields guest requests and questions. Sustainable LED lighting designed by Brooklyn-based manufacturer Stickbulb will be on display in a customized installation of wooden beams of varying lengths, further adding to the lobby’s industrial feel. Glass block upholsters with LED lights on the walls provide a shimmering effect on gold colored Maharam fabric wallpaper. The guestrooms are designed with a natural and neutral palette, allowing the design and fashion-inspired decor to stand out. The dark, rich wood furniture found in the rooms is accented with pops of hot pink, a recurring color throughout the hotel. As a nod to both the publishing and fashion industries, an in-room letterpress block feature includes a quote from famed fashion designers. Letterpress blocks are also used to indicate the room numbers on all 122 guestrooms, including the Penthouse suite located on the 18th floor. Each floor also has a different custom-made panel outside the elevators indicating the floor number. These panels, created by artist Vicky Chan , all feature the same hot pink accent found in guestrooms and a fashion-inspired image. Guests can choose between king or double rooms with features including retail-inspired open armoires where guests can display personal clothing items, desks that double as vanities, patterned couches with multi-textured throw pillows and artwork panels on the ceilings and walls. In place of a lamp, the bedside lighting feature is a chain link lantern attached to a down light, which adds elegance and softness to the room and evokes the style of a necklace. The spacious bathrooms include stand-in showers and C.O. Bigelow amenities. Guestrooms contain stunning views of the Manhattan skyline, including the Empire State Building and Chrysler Building. Hyatt Herald Square New York offers three food and beverage outlets, each with its own distinct identity, headed up by the hotel’s Food & Beverage Director and Executive Chef Gunnar Steden . The hotel’s coffee bar, Espresso Bar, boasts locally roasted gourmet beans from Stone Street Coffee Company and offers a wide variety of barista-prepared espresso, coffee, and specialty drinks, as well as freshly baked pastries from Balthazar Bakery. While a great option for an on-the-go caffeine fix, for those dining in, Espresso Bar offers a separate seating area with swing out stools set in front of an art installation featuring Dali-inspired clocks. In line with the fashion theme of the hotel, each clock is set to the local time of a major fashion capital, including Paris, New York, and Hong Kong. Guests can also peruse vintage newspapers displayed in stacks around the bar. The intimate library-themed lobby bar and restaurant, aptly named The Den, features a casual bistro menu. With emphasis on simple, market fresh ingredients, the menu offers seasonal dishes in three sizes – Large Bites, Light Bites, and Even Lighter Bites – making The Den an ideal option for meals, group sharing, or a quick bite on the go. The bar also features a dedicated cocktail menu with seasonally inspired drinks, some of which are infused in-house. Offering a living room-like feel, The Den includes chairs and tables of varying heights, a bookshelf with a wide variety of media and fashion-focused literature and a comfortable seating area with a writing desk. The bar area looks like a finished bar cart that one might have at home, while the private dining area seating 18 is modeled after an upscale diner with modern, mid-century banquettes and quilted chairs. The hotel’s rooftop lounge Up on 20 boasts stunning views of the Midtown skyline, as well as both the Empire State Building and Freedom Tower, and offers a variety of seasonal cocktails, a selection of local and international beers, wines and spirits as well as the hotel’s small plates menu. The rooftop is also available for small meetings and events for up to 100 people. 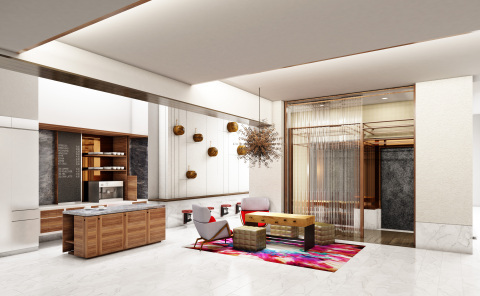 With its proximate location to both Herald Square and the Garment District, Hyatt Herald Square New York will celebrate two of New York City’s most important industries – fashion and publishing. This theme is incorporated in every aspect of the hotel from the interior design by Paul Vega of VLDG Inc., to the guestrooms, dining concept, lobby lounge, and other amenities. A fusion of industrial sophistication and fashion-forward flare, Hyatt Herald Square New York features 122 rooms and one grand suite, as well as a free-flowing lobby lounge with a living-room type feel (Library Lounge); a restaurant and bar (The Den); an espresso bar (Espresso Bar); and a stunning rooftop bar (Up on 20) with views of the Empire State Building and surrounding Midtown skyline, all of which offer local cuisine and seasonal menus of creative cocktails and market fresh dishes. A neighborhood gem, Hyatt Herald Square New York will cater to both leisure guests and locals, and will be conveniently located just steps away from word-class dining, shopping and entertainment, including the Empire State Building, Broadway Theater District, Madison Square Garden, flagship Macy's department store, and Times Square. Chesapeake Lodging Trust is a self-advised lodging real estate investment trust (REIT) focused on investments primarily in upper-upscale hotels in major business and convention markets and, on a selective basis, premium select-service hotels in urban settings or unique locations in the United States. The Trust owns 20 hotels with an aggregate of 6,116 rooms in eight states and the District of Columbia. Additional information can be found on the Trust’s website at www.chesapeakelodgingtrust.com. Real Hospitality Group (RHG) is headquartered in Ocean City, MD with a regional office in Midtown Manhattan in New York City, and comprises a team with more than 400 years of combined hospitality and travel industry experience. The Real Hospitality Group portfolio includes 51 hotel properties with an inventory of more than 6,715 rooms in gateway cities that include New York, Philadelphia and locations in Morgantown, West Virginia as well as Glens Falls, Montauk, New York and Ocean City, MD. The company is a recognized service provider for Marriott, Hilton, Starwood, Hyatt, Wyndham, IHG, and the Choice Hotels brands as well as a collection of unique independent hotels. RHG focuses on total service property management, revenue performance, guest satisfaction and business development for hotels, resorts and investment ownership groups. For more information, please visit the company website at www.realhospitalitygroup.com.